Initiative for Maximizing Student Diversity scholars set record at Annual Biomedical Research Conference for Minority Students. 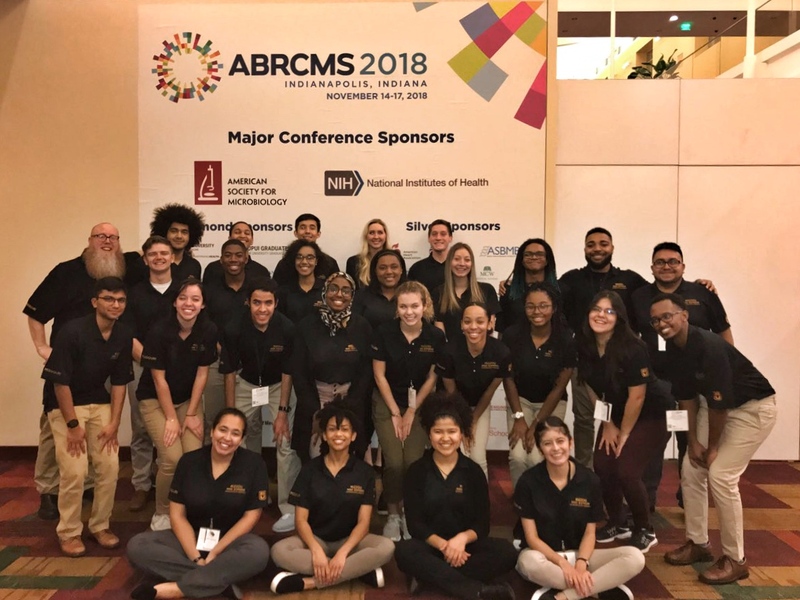 We have returned from this year’s Annual Biomedical Research Conference for Minority Students (ABRCMS) hosted in Indianapolis! Twenty-six of the IMSD Scholars participated, with 17 presenting their research, a record best for our program! We once again had a 100 percent abstract acceptance rate. I am most pleased to announce that for the eighth year in a row, at least one IMSD Scholar from MU has been selected as an Outstanding Research Presentation Award Recipient in their category as very few schools have attained this consistency! The conference included over 2,200 undergraduate presentations and only 319 were selected for this recognition! James Ball, senior, biological sciences. It should be noted that the abstract of Maha Hamed (senior, biochemistry) was selected again for presentation at this year’s conference. As a previous award winner, she was not eligible to be selected for an outstanding research presentation award for a second time. She is also mentored by Dr. Heese. There was a beautiful spirit of community on display as we chanted M-I-Z! Z-O-U! twice during the awards banquet in the convention center amongst the 4,500 ABRCMS attendees. The ceremony was an excellent ending to the conference, yielding well-deserved recognition for our students after weeks of preparation for this year’s meeting. The camaraderie and scientific prowess exhibited was an omnipresent reminder of the bright hope for our future! 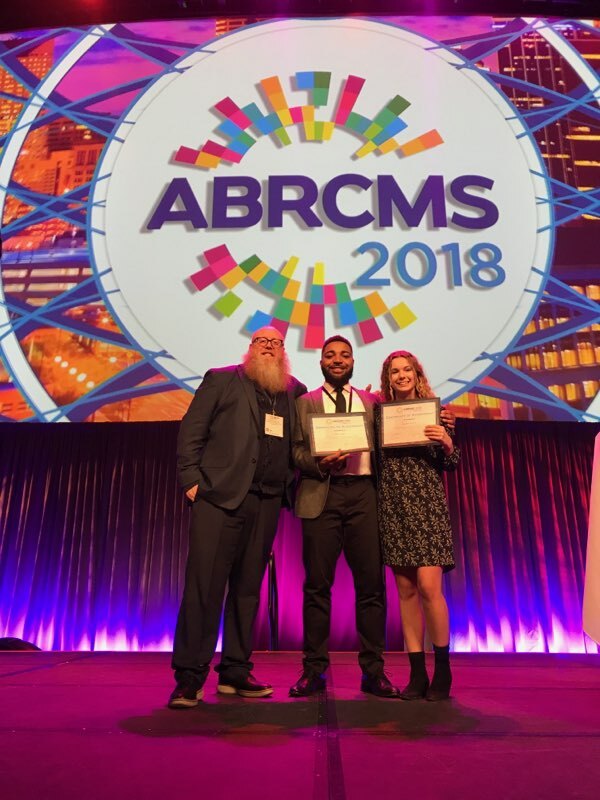 Many thanks to those who assisted with the ABRCMS Draft Poster Session as the students prepared to attend, as well as the ongoing feedback that students received on their poster. You made a difference! Please join me in congratulating these students for their research accomplishments, as well as their faculty mentors for providing an exceptional undergraduate research experience! Christian Aragonez, senior, bioengineering. Faculty mentor: Shawn Bender, Biomedical Sciences. James Ball, senior biological sciences. Faculty mentor: Jaume Padilla, Nutrition & Exercise Physiology. Kaia Davis, senior, biochemistry. Faculty mentor: David Kline, Biomedical Sciences. Laura Ellenberger, senior, biological sciences. Faculty mentor: Kristina Aldridge, Pathology & Anatomical Sciences. Lorena Fernandez, senior, psychology. Faculty mentor: Nicole Campione-Barr, Psychological Sciences. Maha Hamed, senior, biochemistry. Faculty mentor: Antje Heese, Biochemistry. Joshua Jones, senior, biological sciences. Faculty mentor: Manuel Leal, Biological Sciences. Jones presented research from his summer research internship at University of Massachusetts-Boston. Faculty mentor: Michael Shiaris, Microbial Ecology. Paxton Kostos, junior, biochemistry. Faculty mentor: Antje Heese, Biochemistry. Madison Ortega, senior, biological sciences. Faculty mentor: Cheryl Rosenfeld, Biomedical Sciences. Gilberto Perez, junior, biochemistry. Faculty mentor: Kamlendra Singh, Biological Sciences. Zereque Powell, senior, biological sciences. Faculty mentor: Elizabeth Parks, Nutrition & Exercise Physiology. Alana Rodney, senior, biological sciences. Faculty mentor: James Birchler, Biological Sciences. Mathew Sexton, junior, biological sciences. Faculty mentor: Adam Schrum, Molecular Biology & Immunology. Adit Shah, senior, chemistry. Faculty mentor: Susan Lever, Chemistry. Serena Stoddard, senior, biological sciences. Faculty mentor: Charles Nilon, Urban Wildlife Management. Stoddard presented research from her summer research internship at Rhodes College, Faculty mentor: Shanna Stoddard, Chemistry. Christopher Zachary, junior, chemical engineering. Faculty mentor: David Mendoza-Cózatl, Biological Sciences.